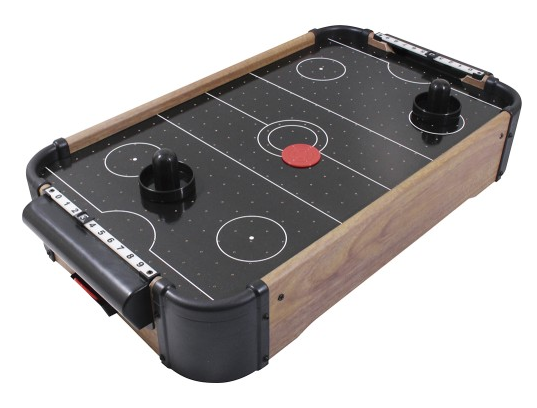 Grand Star Tabletop Air Hockey Just $7.99 Down From $19.99! You are here: Home / Great Deals / Grand Star Tabletop Air Hockey Just $7.99 Down From $19.99! Best Buy has this Grand Star Tabletop Air Hockey on sale for $7.99 (Reg. $19.99)! You can get FREE in-store pick up! Bring the fun of the arcade into your home with this Grand Star SM-35317 tabletop air hockey set, which includes 2 paddles and 2 pucks. The 18.9″L x 11.2″W playing surface fits easily on a table or desk.